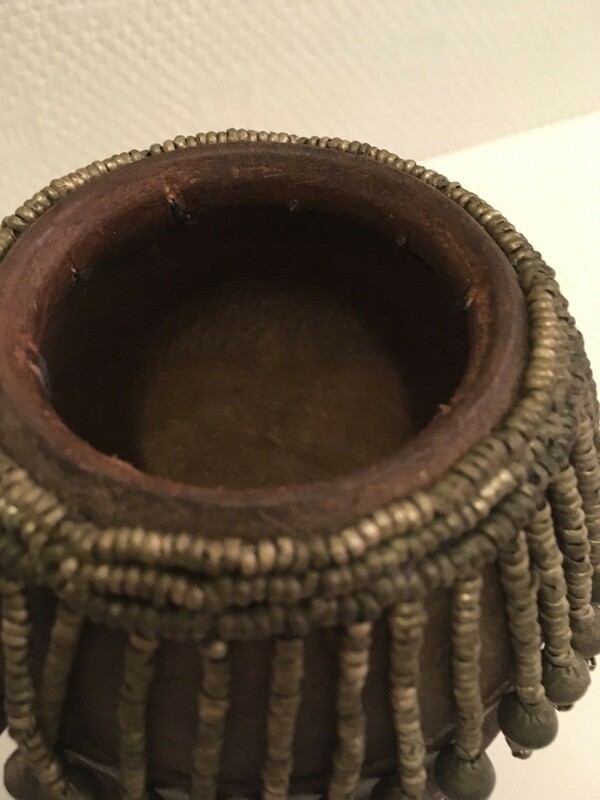 Depending on the tribe, these containers are more or less ornate, decorations or various materials that increase its value and the prestige of its. 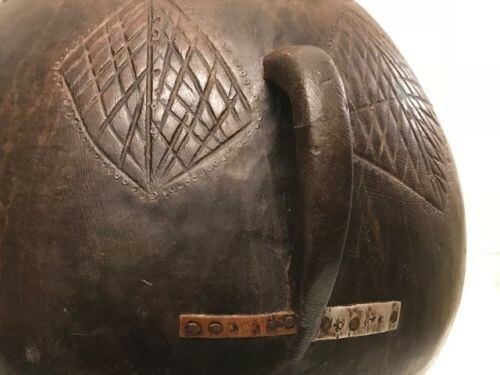 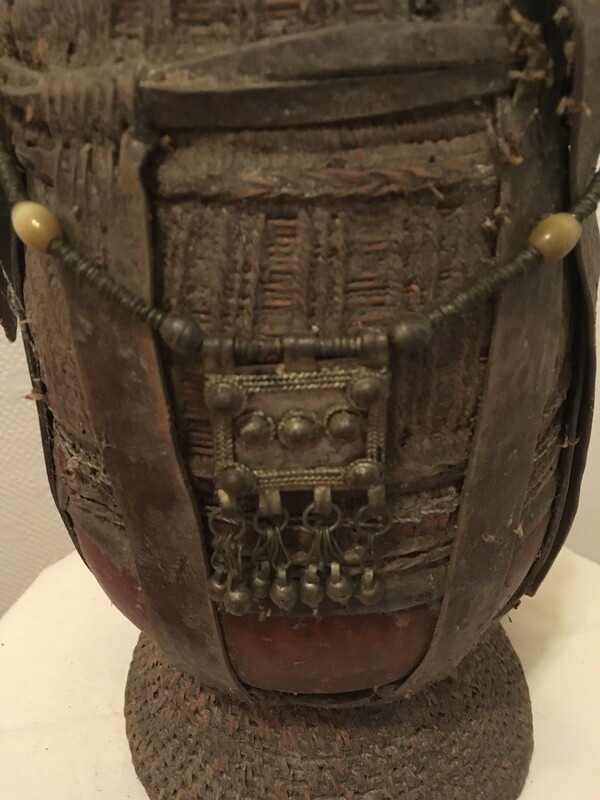 Ethiopian pastoral peoples have a variety of containers made in various materials (gourd, wood, animal horn, plant fibers, and leather) and using different kind of designs and decoration. 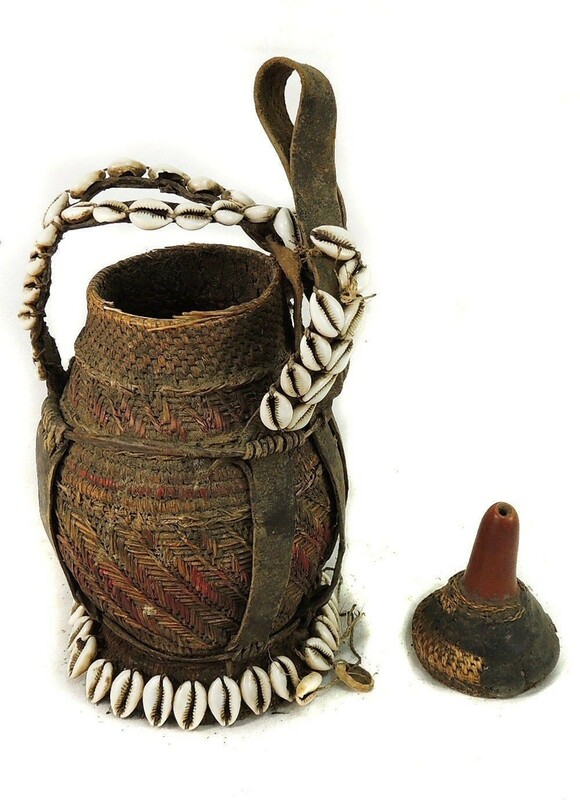 Most of them are made from a combination of media and richly decorated. 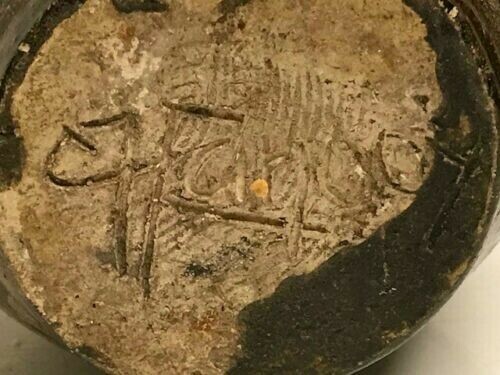 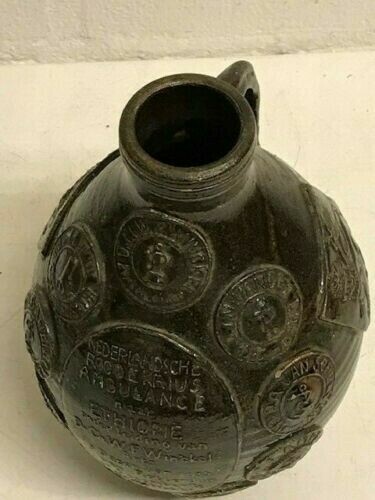 Extremly Rare antique memorial jar of the Dutch ambulance in Ethiopia. 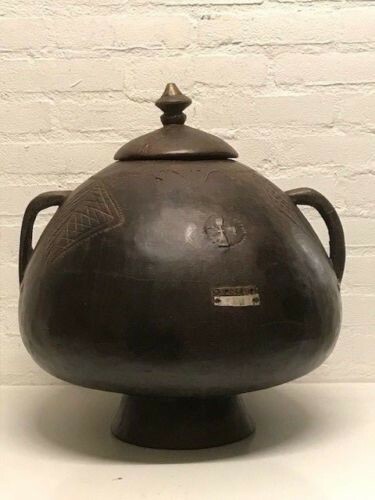 Brown jug with arms and text in relief "Nederlandsche Roode Kruis Ambulance naar Ethiopië ..."
description Jug: Spherical body, arched ear. 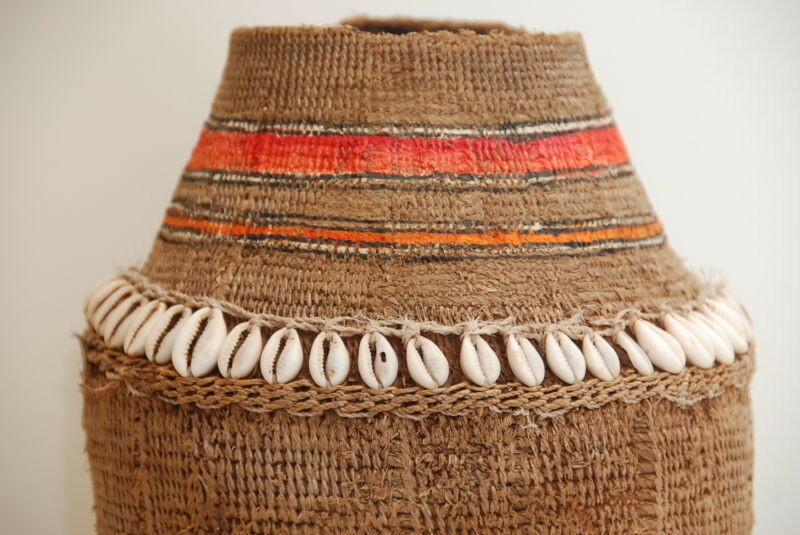 narrow short, ribbed neck opening. 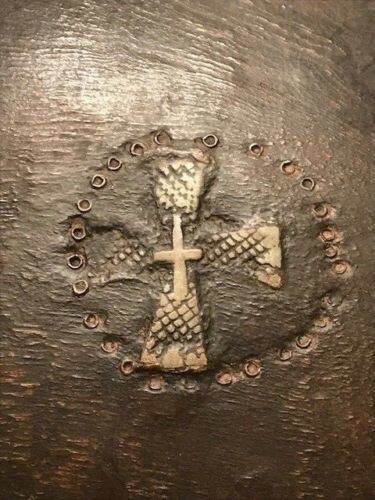 On belly: small round stamps around large oval stamp in high relief with Red Cross and Aesculaap symbols. 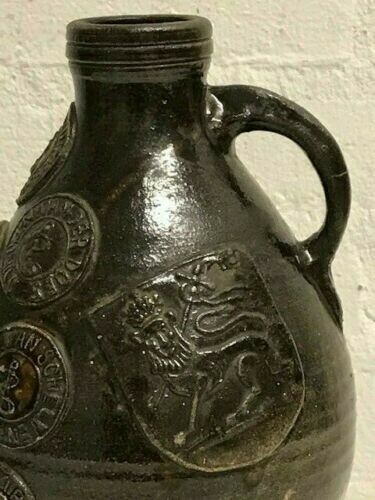 Two coats of arms with (standing and running) lion. 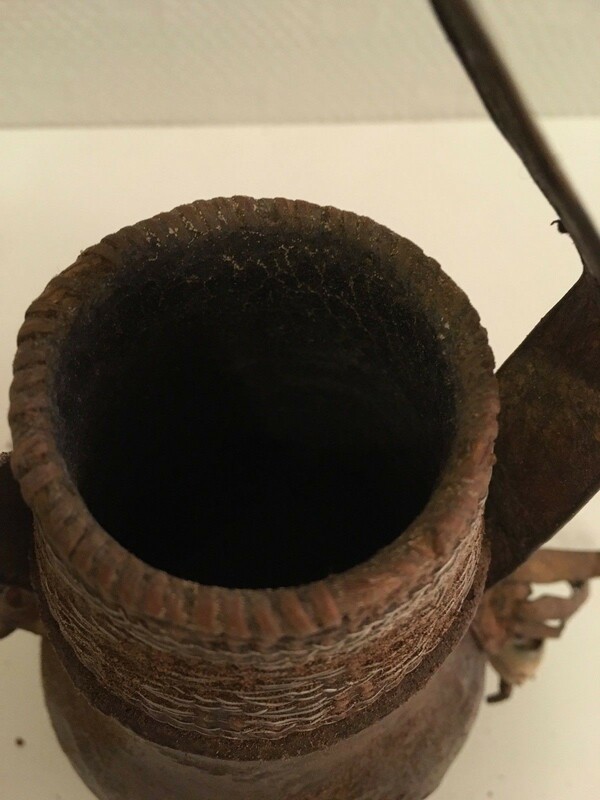 Completely glazed. 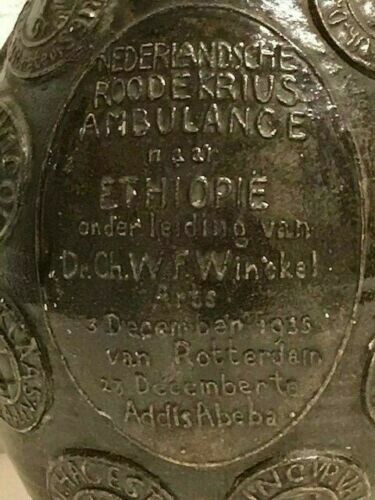 In various stamps on belly: "Nederlandsche Roode Kruis Ambulance to Ethiopia under the direction of Dr. Ch.W.F. 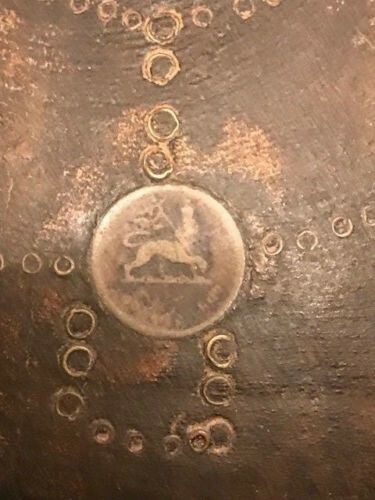 Winckel Arts 3 December 1935 of Rotterdam December 23 in Addis Ababa. 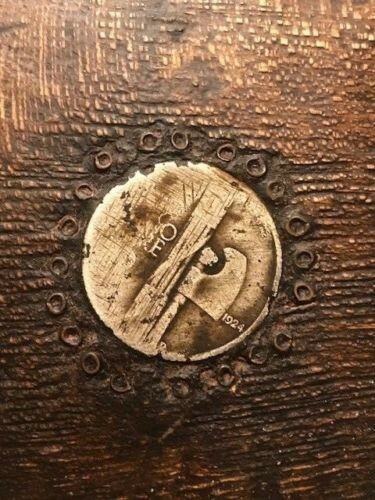 "; "Dr. Ch.W.F. 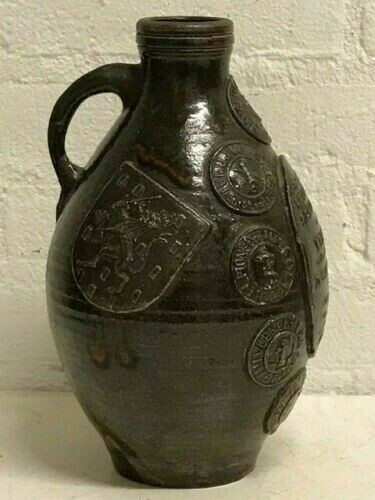 Winckel physician Leiden"; "D.A. 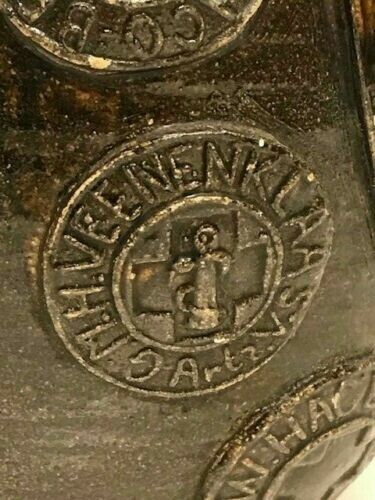 van Schelven surgeon"; "Dr. A.H.M. 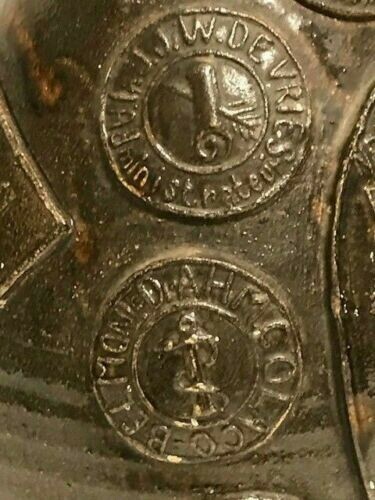 Colaco-Belmonte"; "G.M.H. 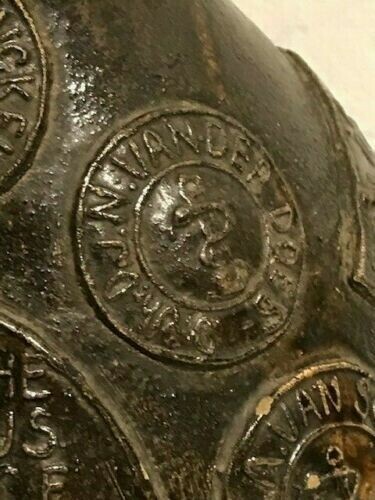 Veenenklaas doctor v."; "W. Hagenstein nurse"; "Van Den Honing vp"; "C. Lampe doctor nurse"; "Jr. D.J.N. 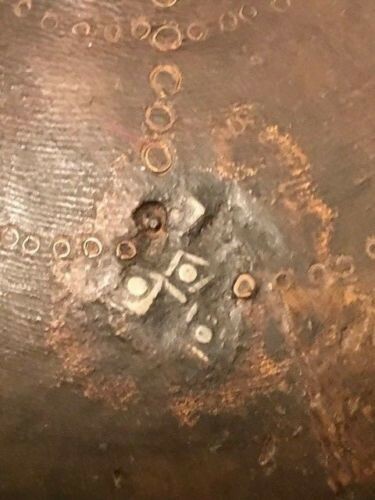 Van Der Does"; "J.J.W. 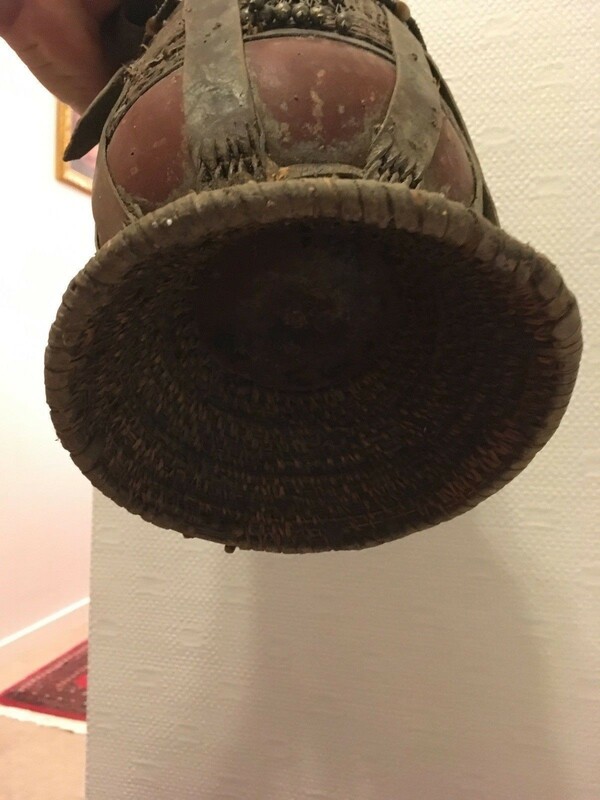 De Vries Administrator". 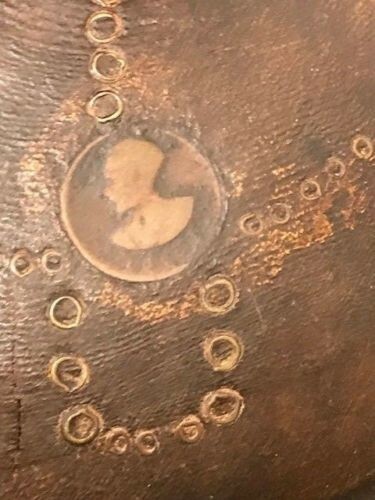 Bottom of bottom engraved: signed from C.J. 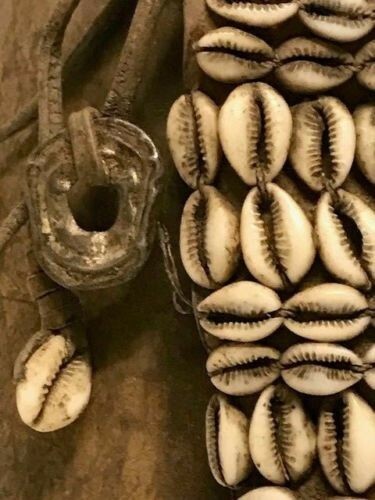 Lanooy. 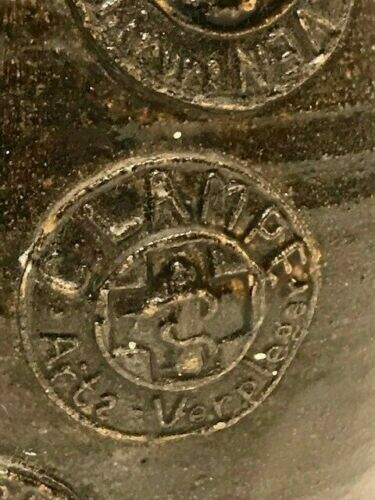 potter: Chris Lanooy (Sint Annaland 1881 - Epe 1948) Dating 1935 and 24 cm high. 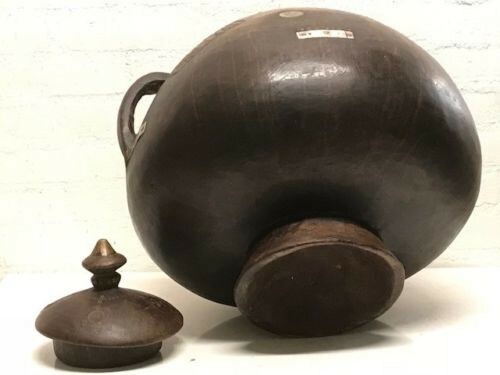 On 2 October 1935 Italy invaded Ethiopia. 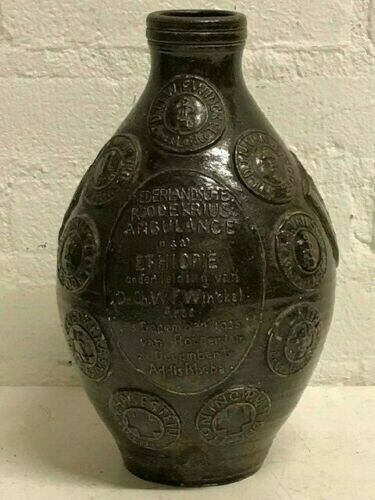 The jug was made to commemorate the broadcast of a Dutch Red Cross ambulance to Ethiopia on 3 December 1935. 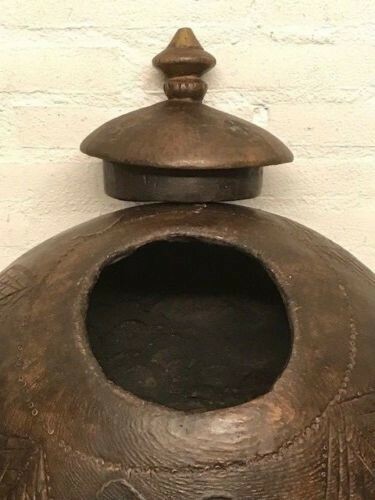 Present in collection Rijksmuseum Amsterdam - Netherlands. 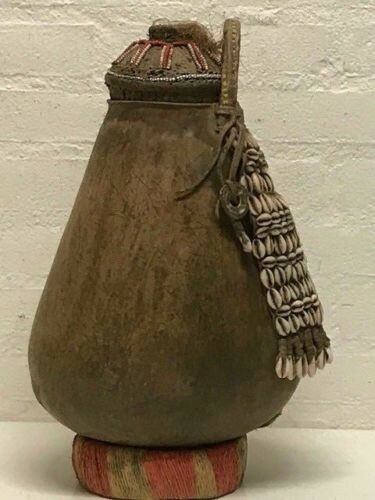 180804 - Old Tribal used Traditional Afar Milk jug / Basket - Ethiopia. 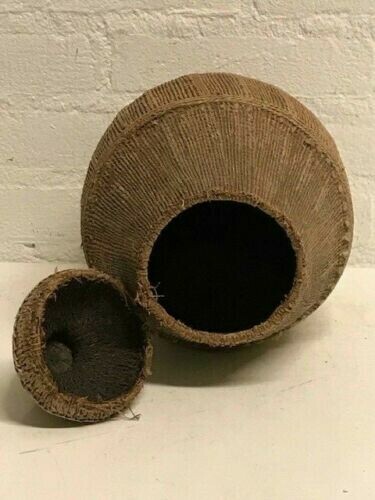 Original and authentic piece - Dimension 39 cm high. 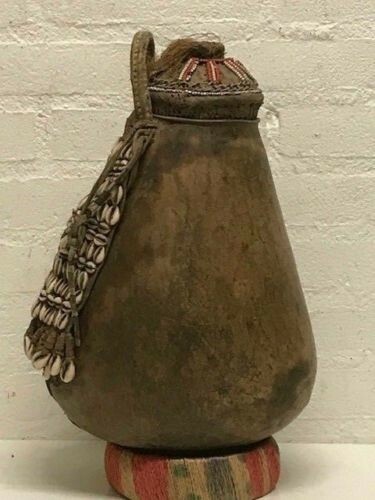 180732 - Old Tribal used Traditional Afar Milk jug / Basket - Ethiopia. 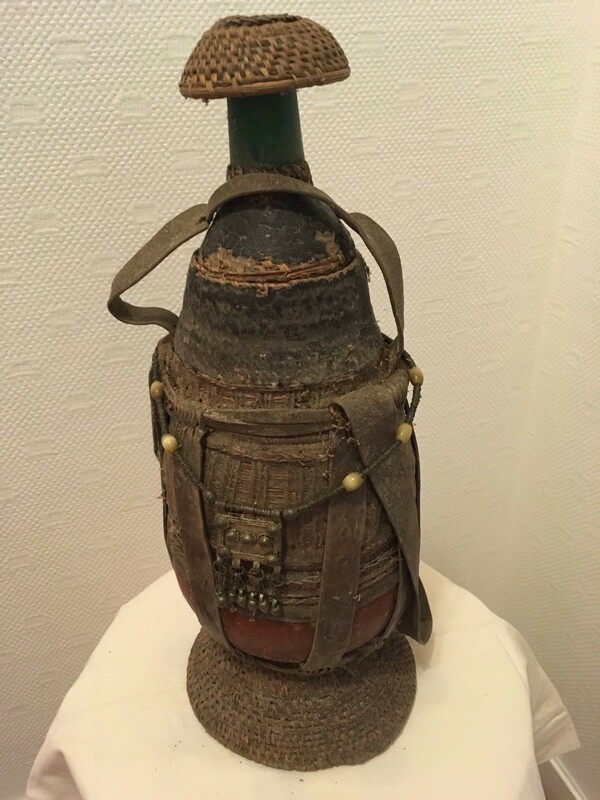 Original and authentic piece - Dimensions 40 cm high. 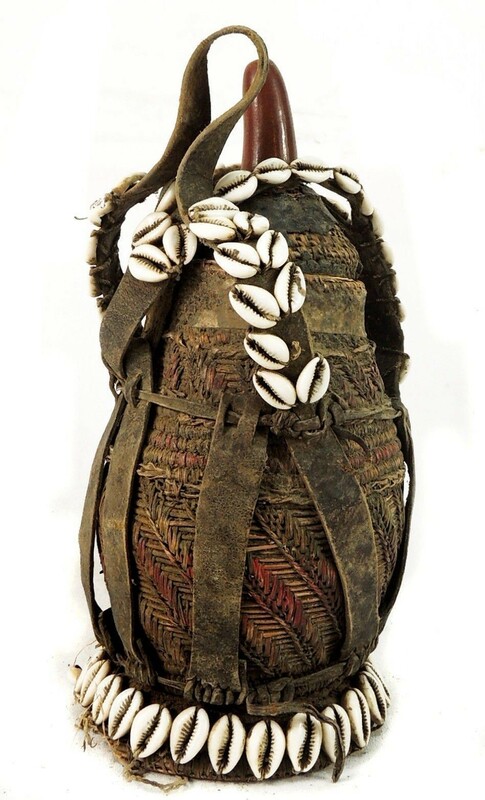 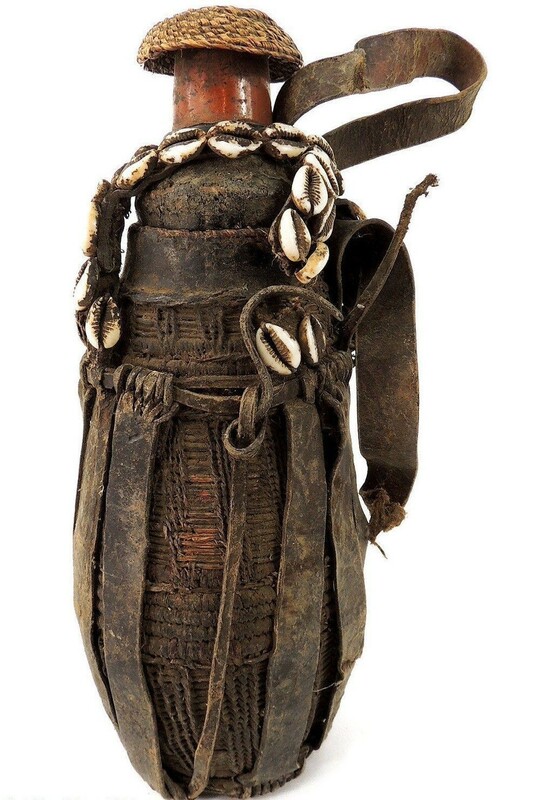 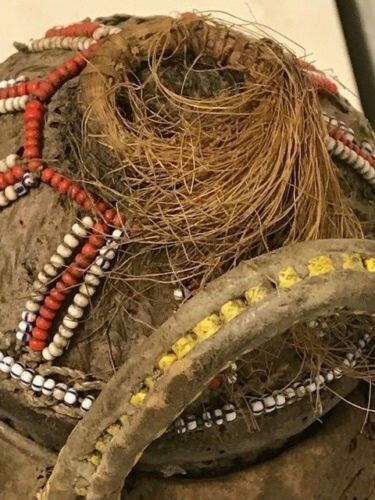 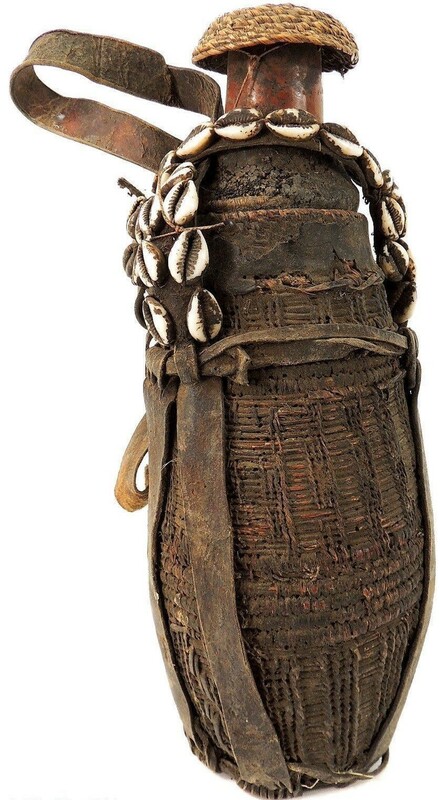 180731 - Old Tribal used Traditional Afar container. 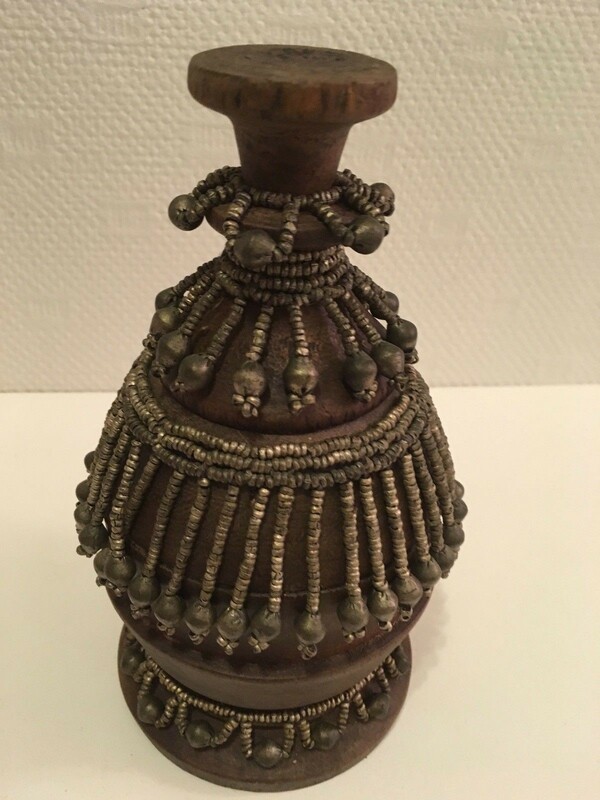 Original and authentic piece - Dimensions 20 cm high. 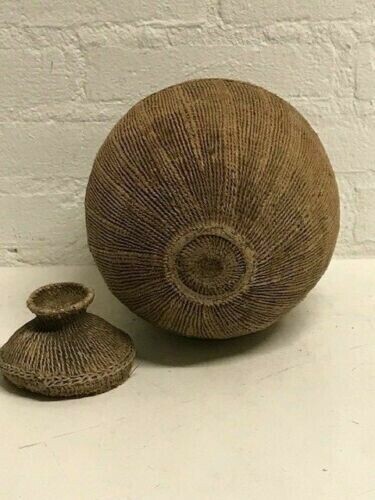 170107 - Old Tribal used Ethiopian Lidded Milk Jug Gourd Basketry - Ethiopia. 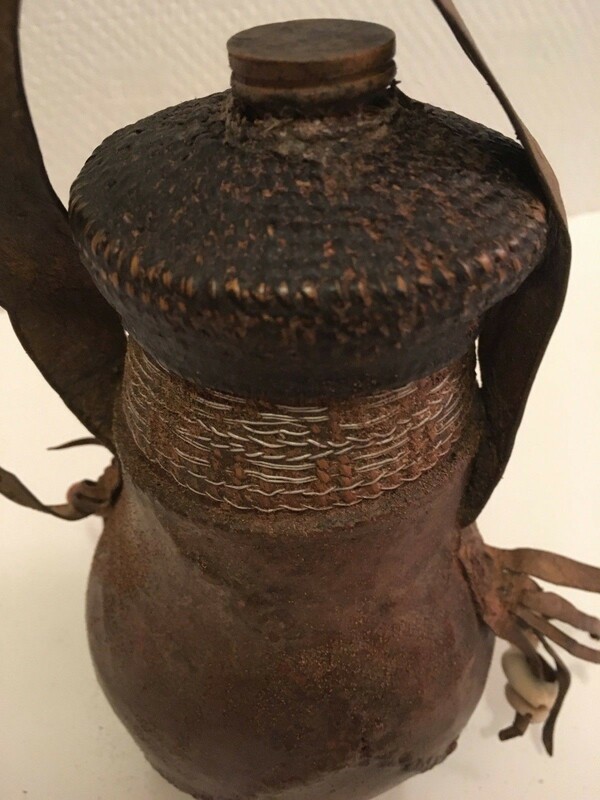 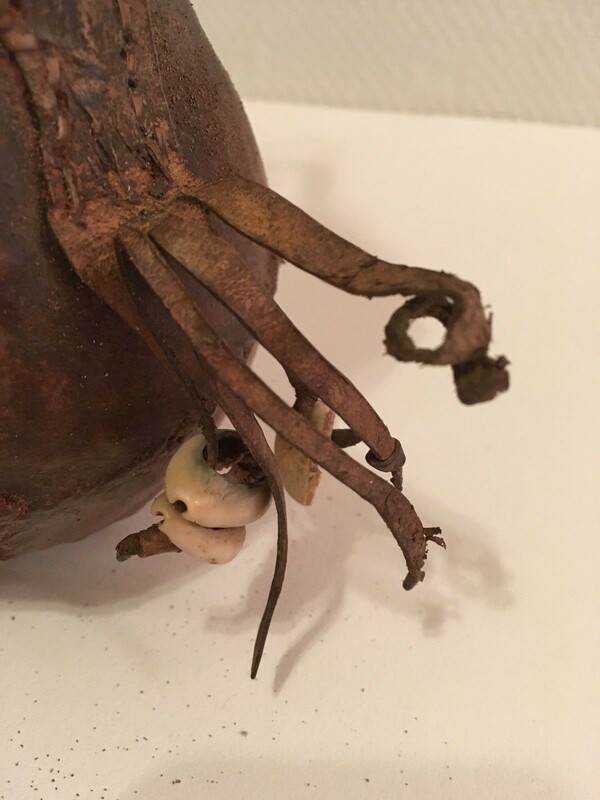 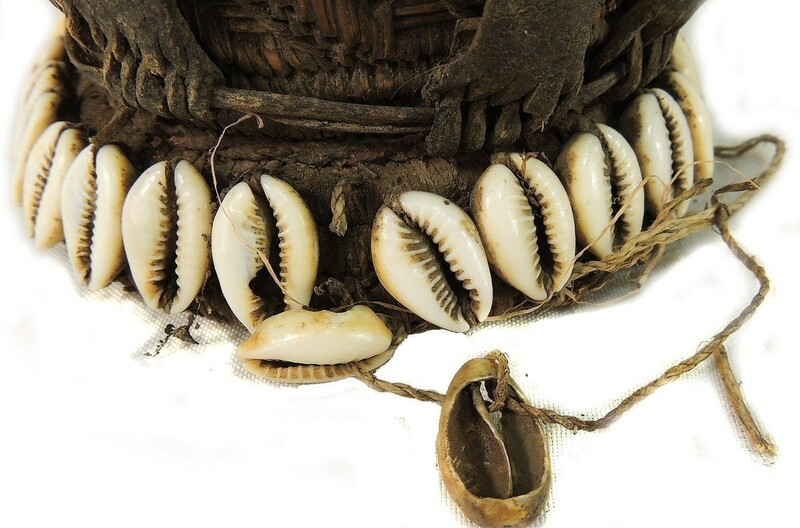 Ethiopia: Old Tribal used Ethiopian Lidded Milk Jug Gourd Basketry. 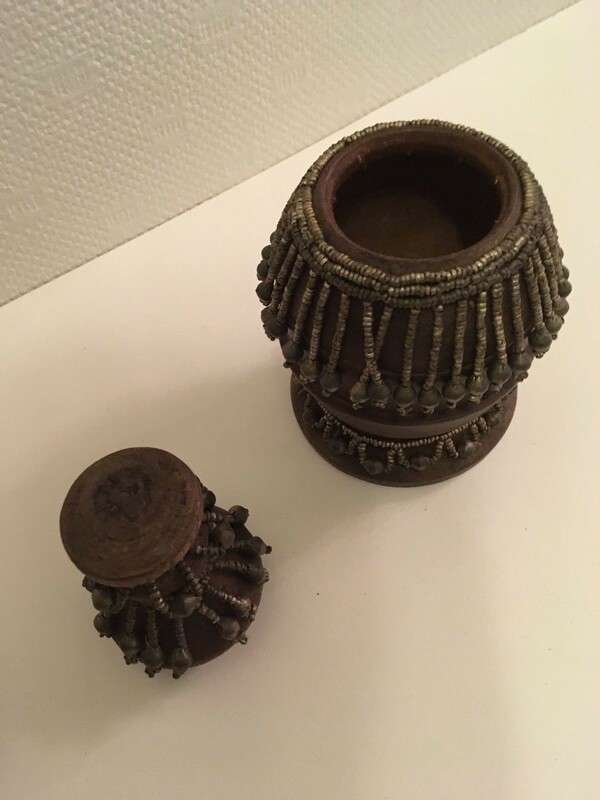 The size are 30 cm high. 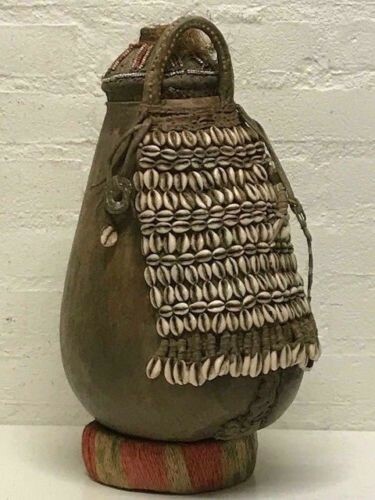 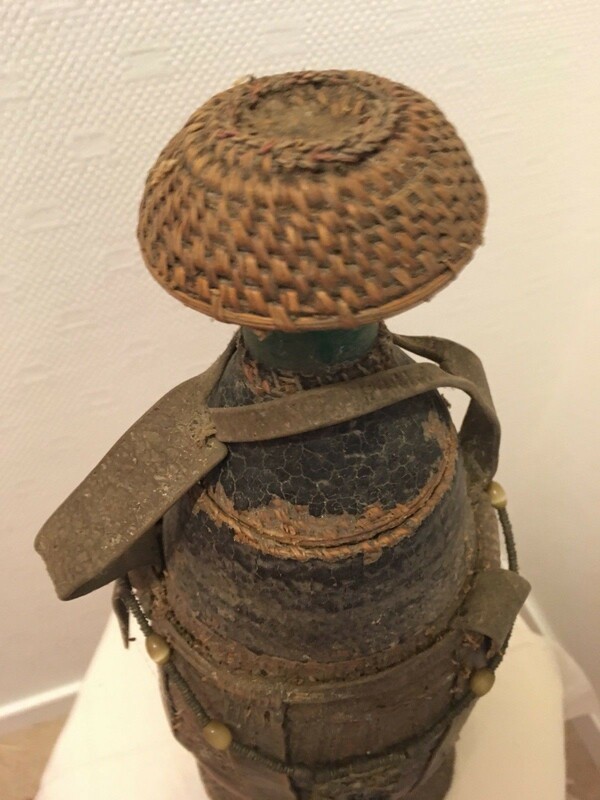 Old Tribal traditional Afar Jug / Basket. 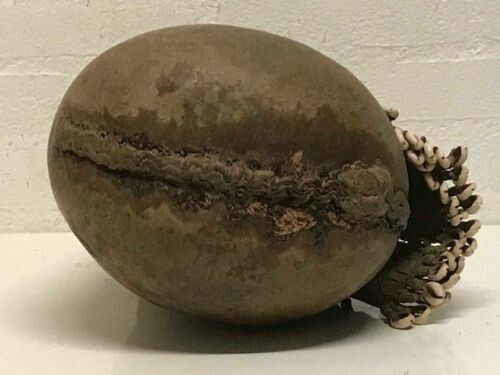 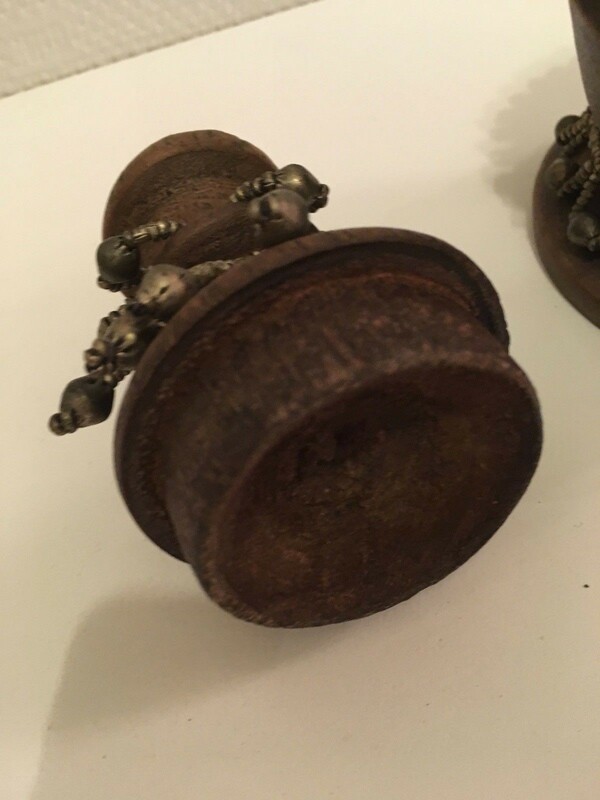 Original and authentic piece - Dimensions 17 cm high. 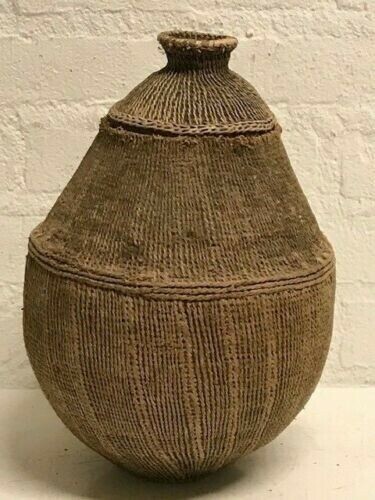 171203 - Extremly Rare Tribal used Borana Gorfa Woven Milk Container - Ethiopia. 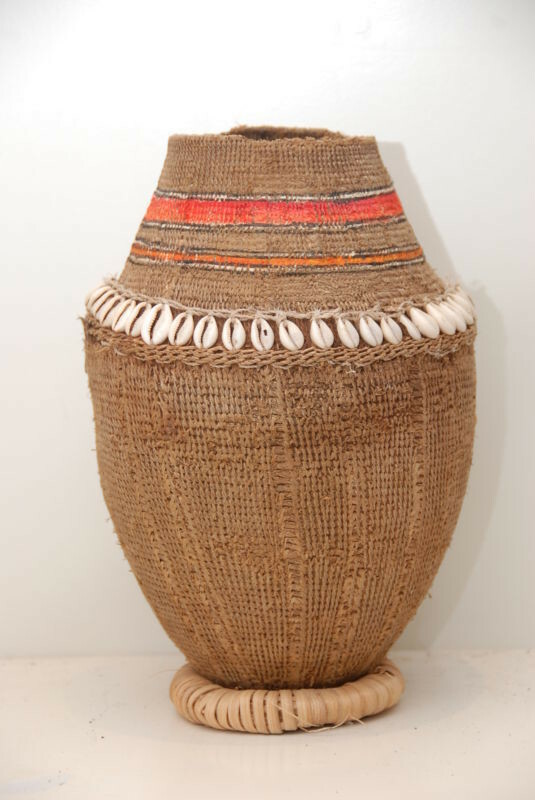 This is a authentic traditional Extremly Rare Old Tribal used handmade Ethiopian Borana "Gorfa" woven milk Container. 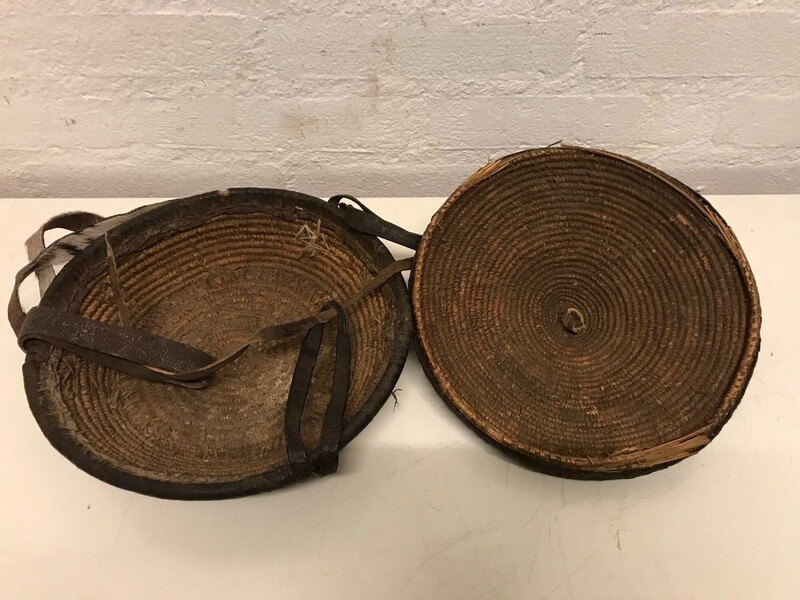 The size are 28 cm high. 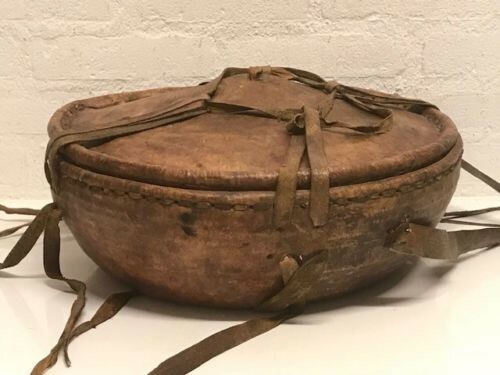 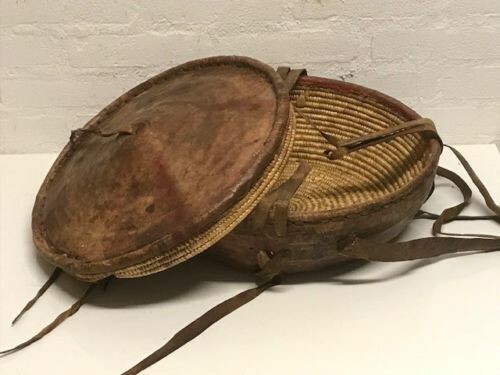 180630 - Old Tribal used Ethiopian Large Injerra leather basket from Ethiopia. 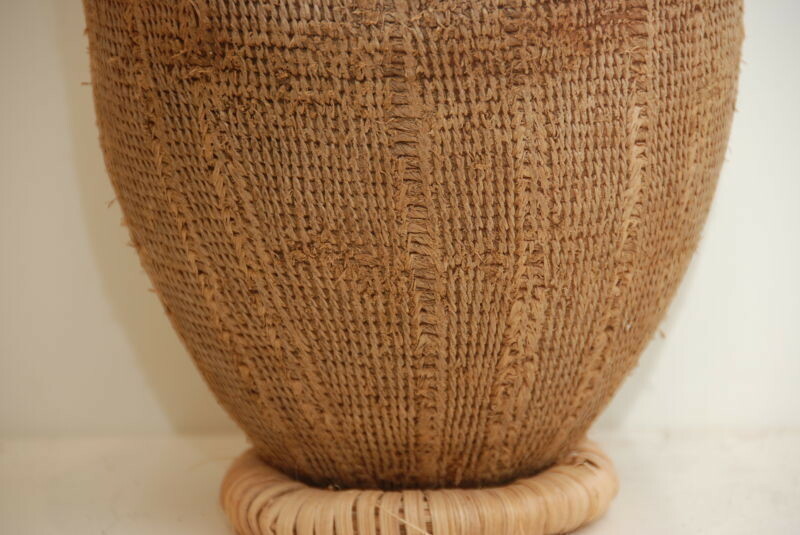 Large Traditional Ethiopian injerra basket from leather. 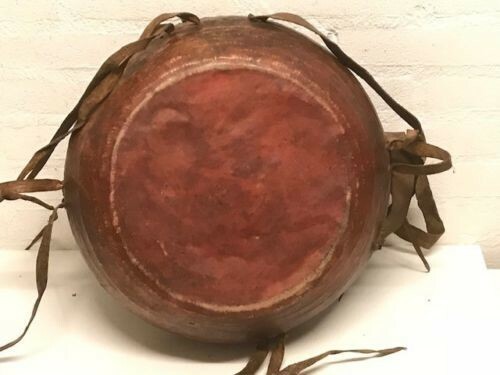 Diameter 40 cm and 17 cm high. 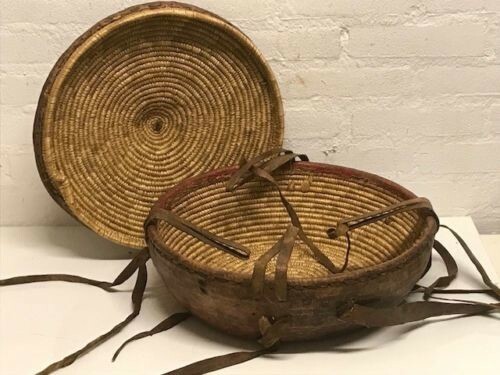 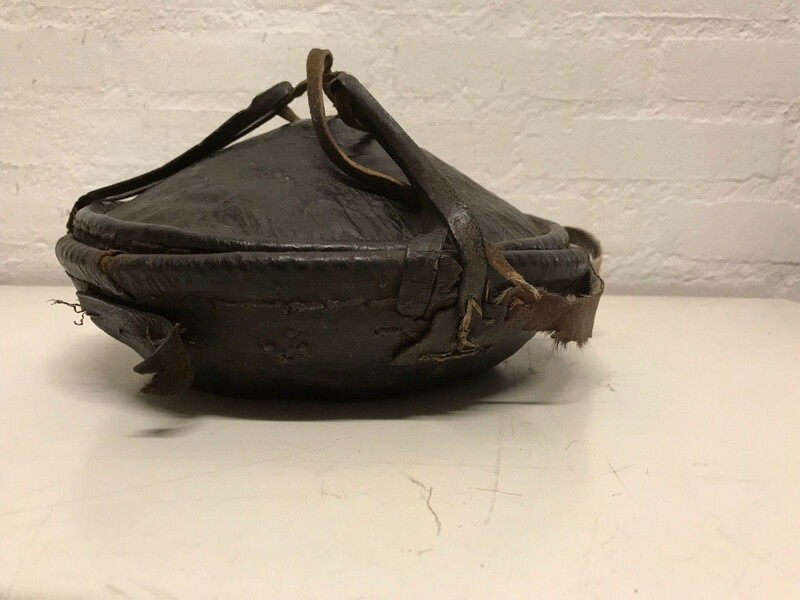 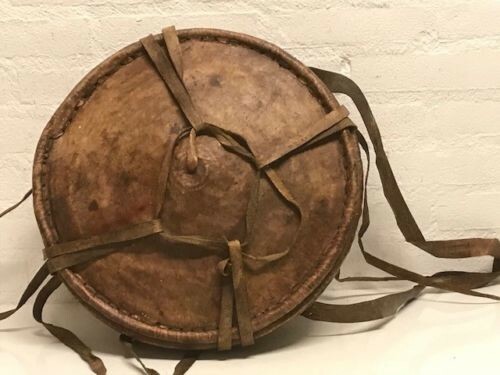 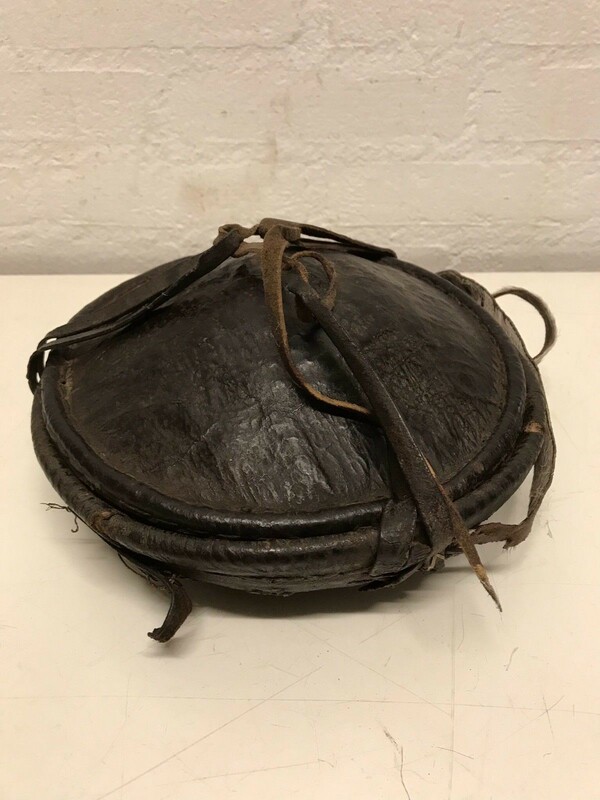 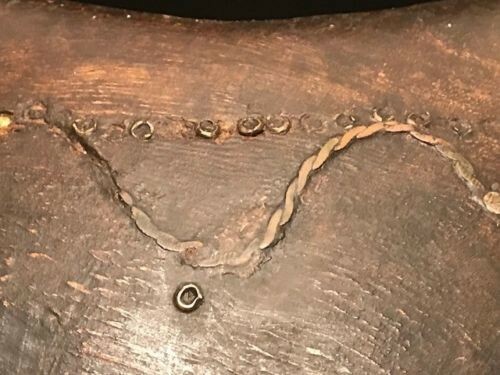 180318 - Old Tribal used Ethiopian Injerra leather basket - Ethiopia. 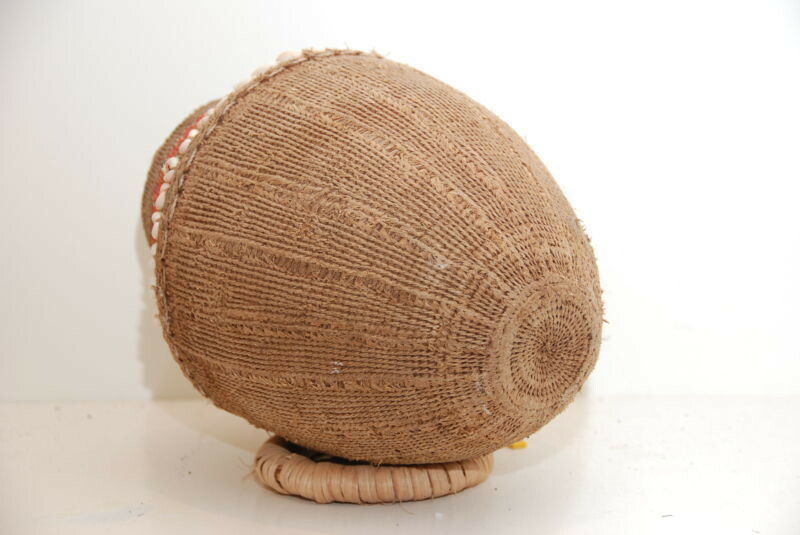 Traditional Ethiopian injerra basket from leather. 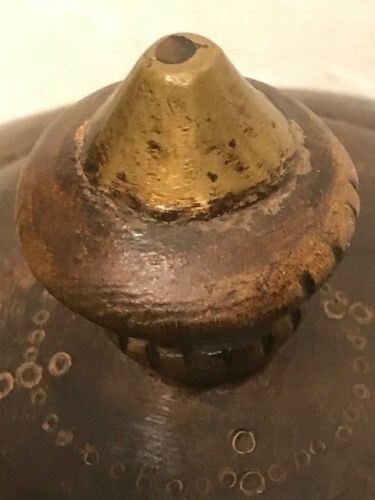 Diameter 23 cm and 10 cm high. 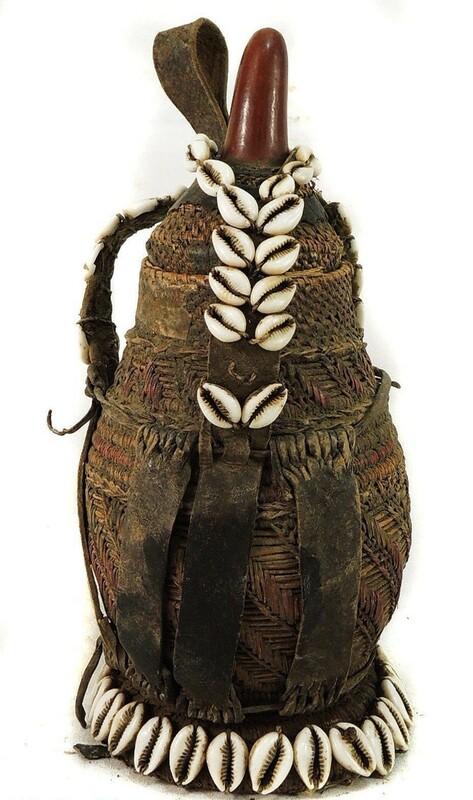 190132 - Extremly Rare Tribal used Borana Gorfa Woven Milk Container - Ethiopia. 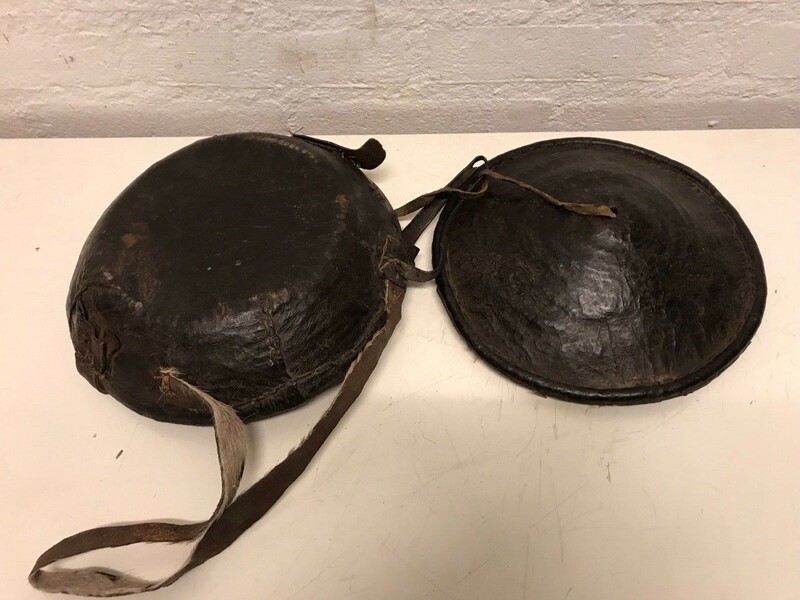 The size are 27 cm high. 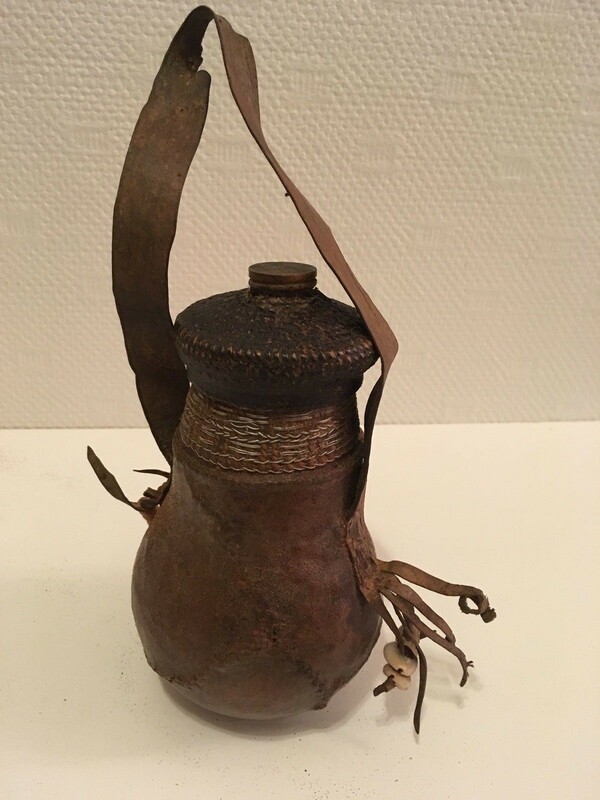 170919 - Ethiopian Old Tribal used African Borana Milk Container - Ethiopia. 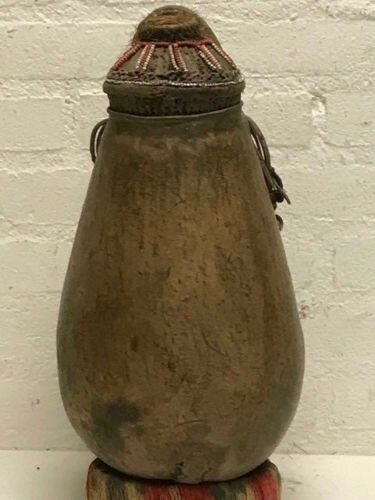 This is a authentic traditional Old Tribal used handmade Ethiopian Borana milk Container. 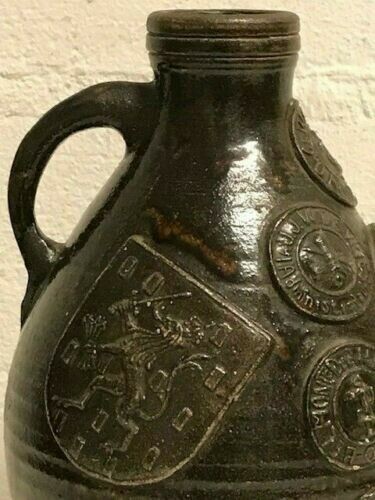 The size are 34 cm high. 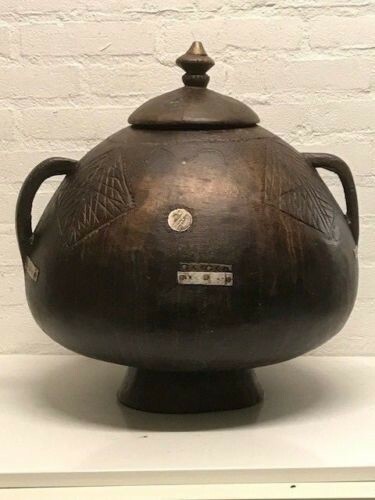 180740 - Large & extremly Rare Tribal used Ethiopian Oromo wooden Butter Container - Ethiopia. 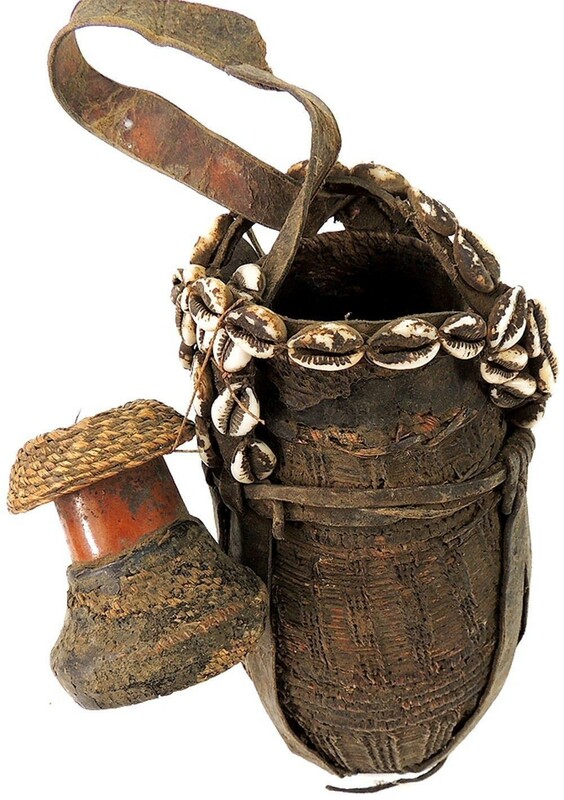 Extremly Rare Large & Old Tribal used traditional Ethiopian Oromo wooden Butter container. 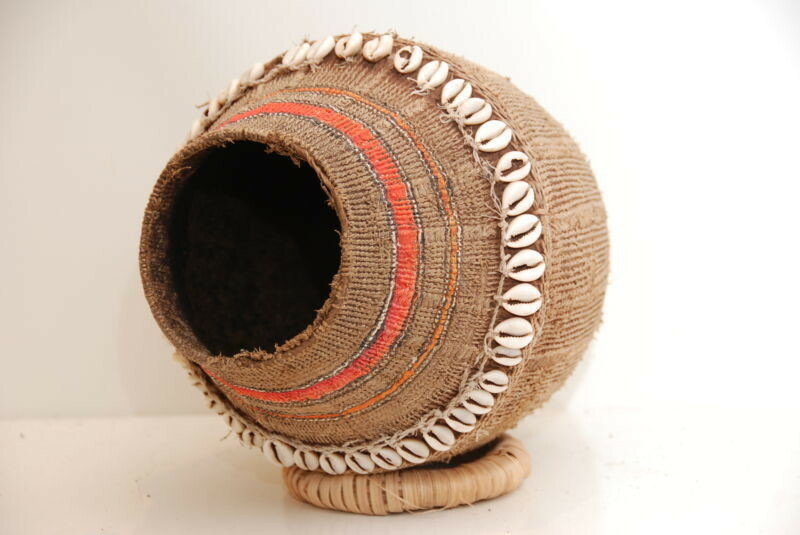 Dimensions 47 cm high and 48 cm wide. 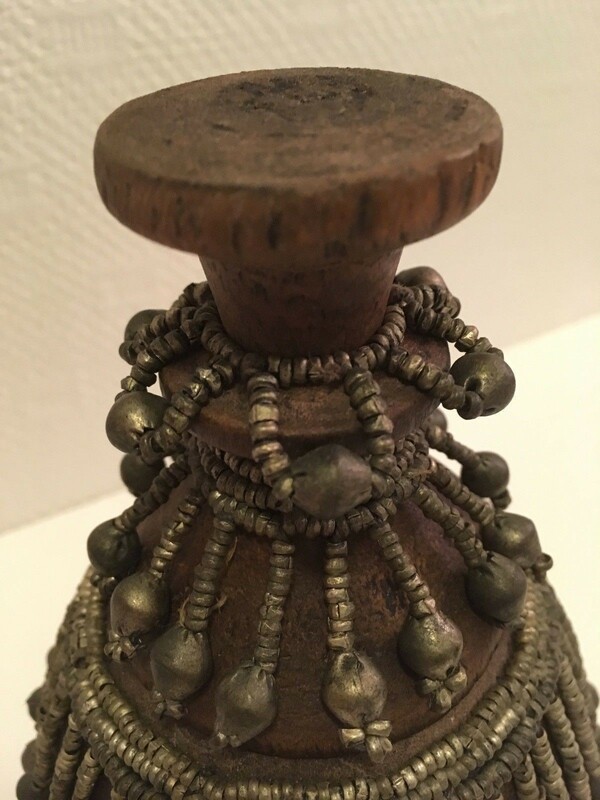 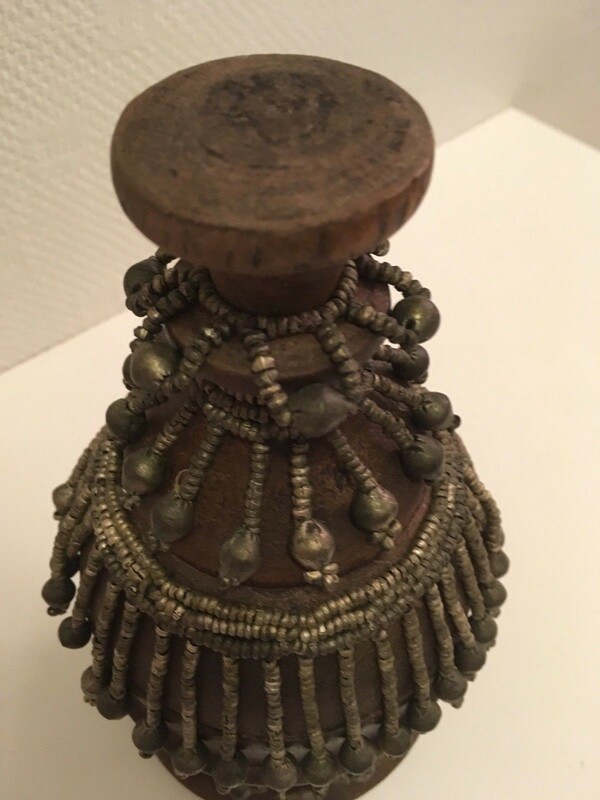 Wood Milk or Butter Container Oromo Tribe beautiful glossy Patina and silver ornaments and coins.